bLuGrn Updates: New in June! 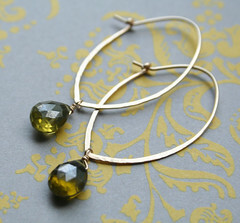 GREEN and GOLD- lush and vibrant ready for summer. Epecially paired with 14/20 goldfill. 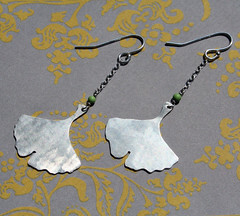 GINKGO Earrings- Already green and thriving with their beautiful fan-shaped leaves, enjoying the summer heat. Did you know: The Ginkgo has the intriguing distinction of being one of the world's most urban-tolerant trees, often growing where other trees cannot survive. 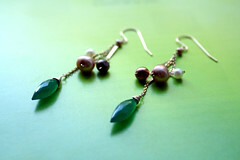 These earrings are a tribute to these beautiful and hardy trees, and sure to compliment your summer look and be a lasting accessory for any season. SHOWN: Sterling silver hand cut silhouettes with turquoise accent bead. Child's birdie necklace- All girls love to accessorize! Little ones too! This is a miniature version of the flying birdie necklace and sized to fit your tot at a lenght of 13 inches and mini bird charm and pendant measuring a mere 1.5 cm. Shark bites-A little of wit with a bit of shark. Perfect little summer necklace! Tiny sterling tags with varied phrases to match the little shark's tooth fossil which measures less than 1/2 an inch.